Add charm and presence with this aesthetically pleasing chair. The gentle curves provide style and comfort. Adding colorful chairs can rev up any setting. 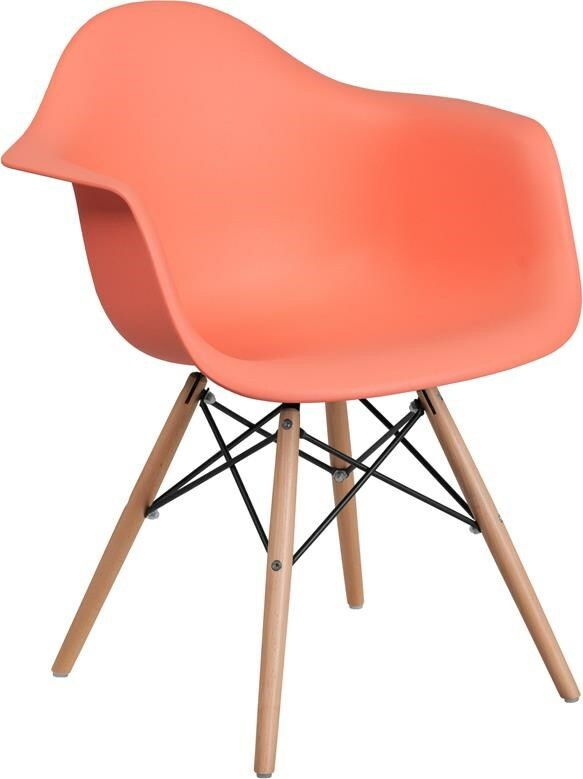 This chair features a durable plastic molded seat and wooden legs. The versatility of this chair will have you in the office negotiating deals to in the home enjoying time with family. No matter the use, this chair is well suited to provide a complementary presence. The Alonza Arm Chairs Peach Plastic Arm Chair with Wooden Base by Winslow Home at Sam Levitz Furniture in the Tucson, Oro Valley, Marana, Vail, and Green Valley, AZ area. Product availability may vary. Contact us for the most current availability on this product. Browse other items in the Alonza Arm Chairs collection from Sam Levitz Furniture in the Tucson, Oro Valley, Marana, Vail, and Green Valley, AZ area.